The ideal partner for the New Koleston Perfect with Me+. Available in different volume for all the services possibilities (1.9%, 4%, 6%, 9% and 12%). 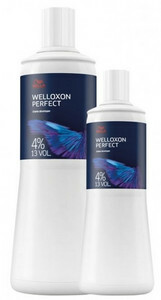 Remember with new Koleston Perfect ME+ (or mixing old and new Koleston Perfect ME+), it has to be used with new Welloxon Perfect. If it is used with other developers we cannot guarantee colour results as well as application/ mixability/scalp comfort benefits and is therefore not recommended.